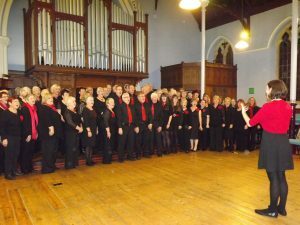 The choir was founded in 2009 by Nigel Jones on his retirement from a career as a high school music teacher and county music service choral animateur. October 2013 saw the arrival of our new musical director, Rosie Howarth. From her first concert, at Christmas that year, Rosie has developed and extended the choir’s repertoire to include a wide range of styles – from African song to music theatre. In July 2015 Nigel retired from choral conducting. Rosie became the Artistic Director, while continuing as Musical Director of the Community Chorus. Rosie Howarth has completed an MA in Choral Conducting at the Royal Welsh College of Music and Drama, under the tuition of Neil Ferris and Sarah Tennant-Flowers. Prior to this she studied Music and German at Cardiff University and the Freie Universität, Berlin, graduating with first-class honours in 2012 and receiving the David Evans prize. She has recently taken on the role of Musical Director of several choirs in Wales and England. Rosie has sung and played the violin in a number of ensembles in England, Wales and Germany. As a singer, she is currently a member of the BBC National Chorus of Wales, with which she regularly performs on BBC Radio 3 and BBC Four, at the BBC Proms, and has made several CD recordings. Accompanist, Ceri Gifford-Berry studied piano and composition at the Welsh College of Music and Drama and graduated with an honours degree. She completed her Post Graduate Certificate of Education at the University of Wales Institute, Cardiff. Ceri began her teaching career at Caldicot Comprehensive School then taught Music and Performing Arts at St Cenydd Comprehensive School in Caerphilly for 12 years. Ceri currently works for Gwent Music Service teaching piano and for Upbeat Music and Arts working on whole class music projects with staff and pupils in primary schools. She accompanies instrumentalists for grade exams and has been accompanist for both the Caerphilly Children’s Choir and Caerphilly Youth Singers.